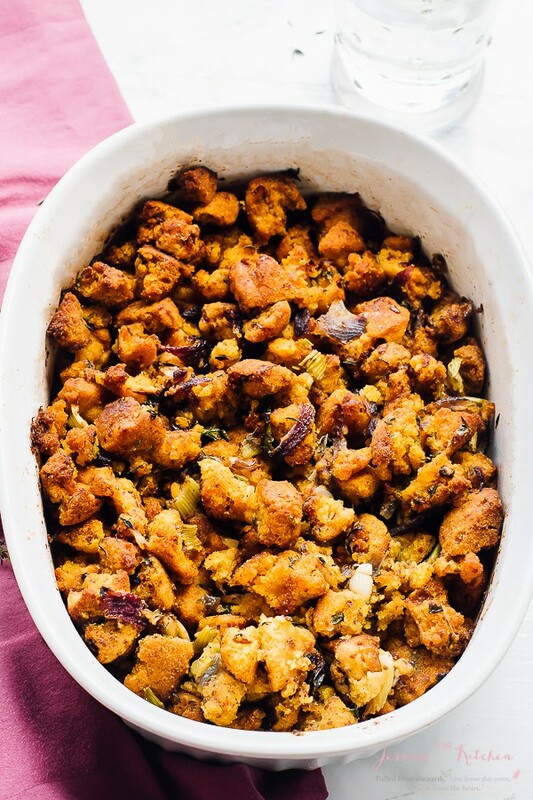 This Gluten Free Cornbread Stuffing will be a star at your Thanksgiving dinner! It’s a healthier side dish that is deliciously simple, loaded with lots of flavour and is vegan! Believe it or not, this is only the second time I’ve made my own stuffing. The first time was a million plus years ago. Somehow, I never got into it, but after making this gluten free cornbread stuffing aka cornbread dressing, I am NEVER going back to the boxed stuff. Let me tell you, this stuffing went fast among my family. Okay, so maybe I ate most of it, but ANYWAY. 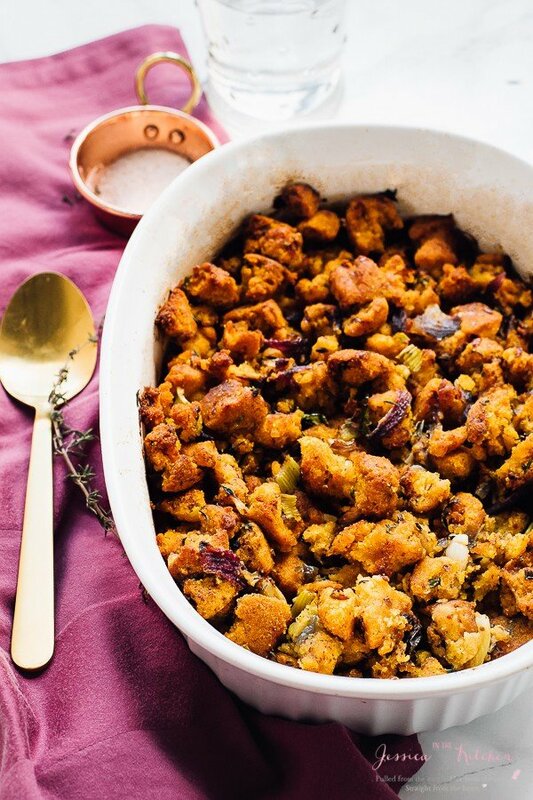 You will not believe just how easy this stuffing is to make. Mix together, then bake. 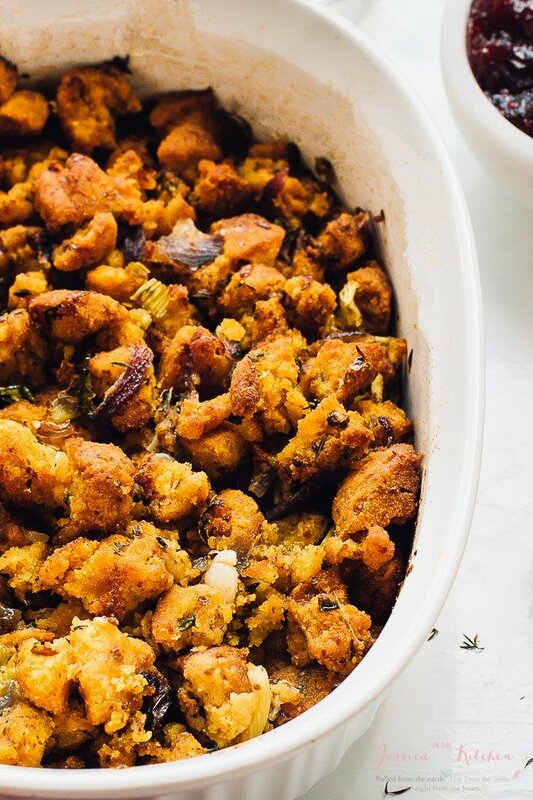 Let’s talk about how well seasoned this stuffing is. I’m talking sage, parsley, celery, onions, garlic, thyme…the last goes on. 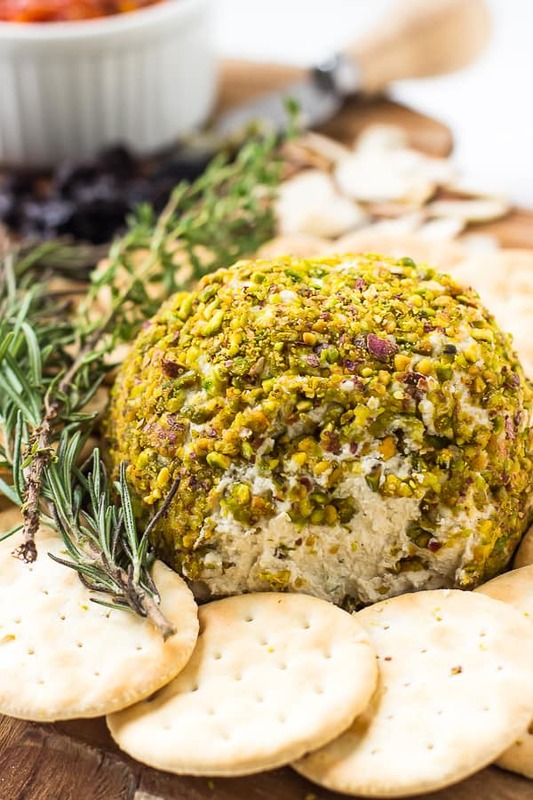 Every bite gives you a mouthful of flavourful wonderfulness. I’m not sure if those two are real words, but it’s the best description I have for this right now. Next, let’s talk about that cornbread. 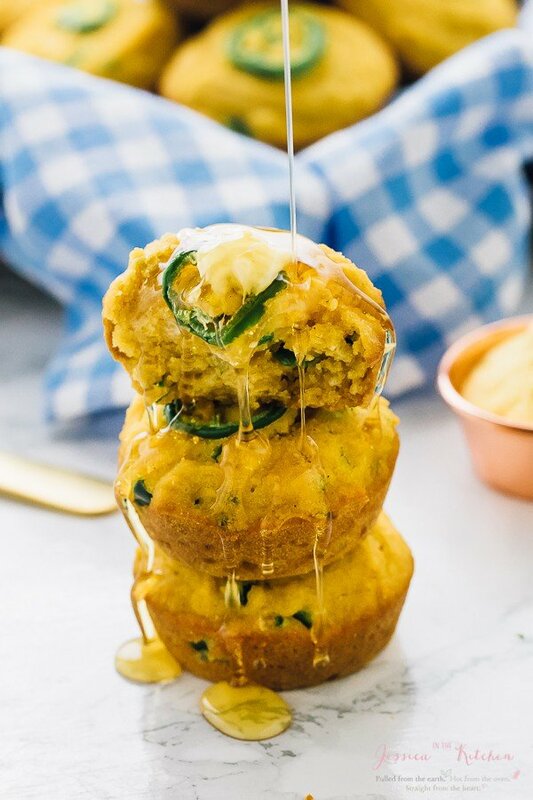 I used my jalapeño gluten free cornbread muffins for this and let me tell you, you need to make it. 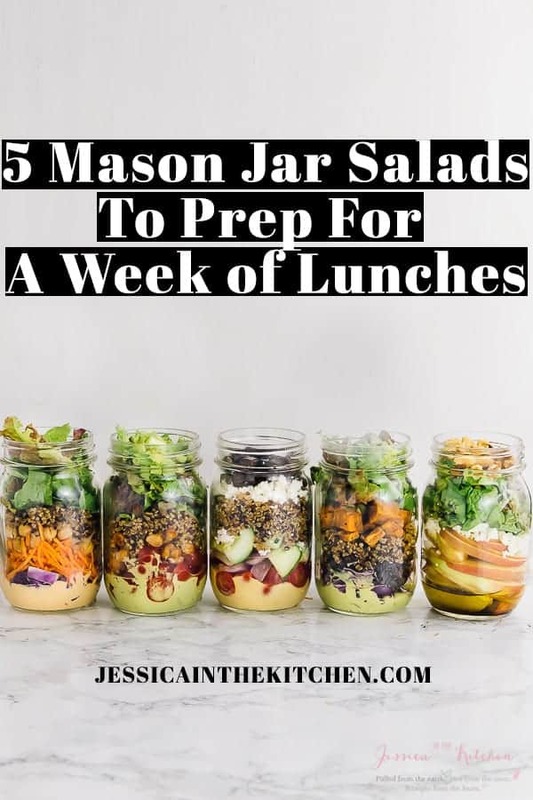 It tastes like 8 minutes prep (seriously) then you can either let it sit overnight to dry out, or stick it in the oven to dry it out. It’s the perfect cornbread recipe to soak up all that flavour from the seasonings, jalapeño and vegetable broth. 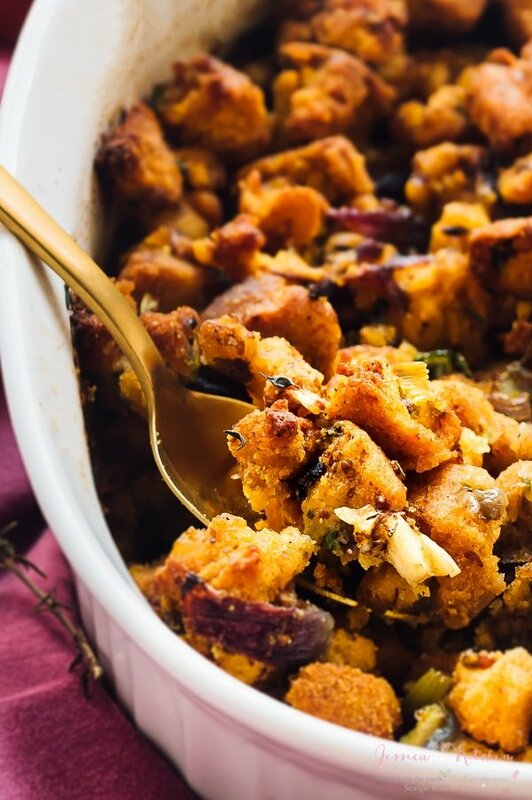 This gluten free cornbread stuffing is 100% the right ratio of moist and seasoning. It’s also vegan so you can pretty much everyone can enjoy this. This is definitely a perfect recipe to serve at your Thanksgiving dinner and I PROMISE you, you won’t regret it. P.S. feel free to customise this beauty to your heart’s content. 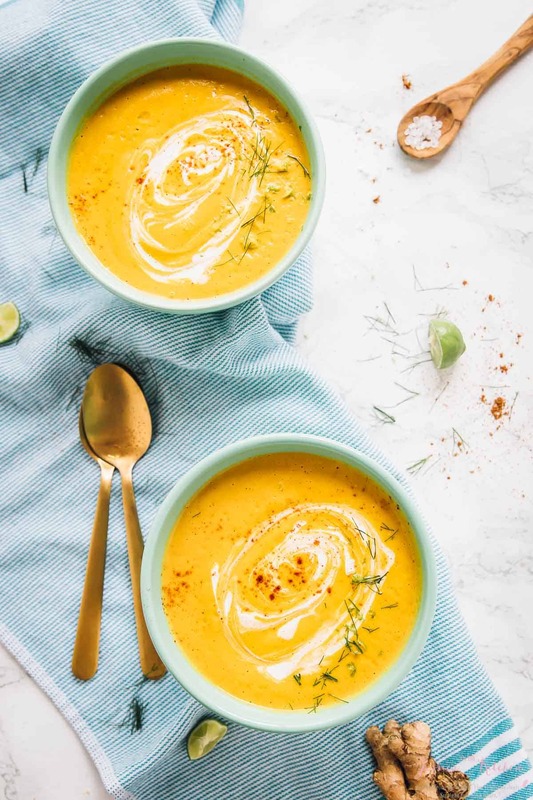 More broth, less broth, more seasonings or additions – it’s your world. This cornbread is loaded with fibre thanks to the flax eggs and gluten free cornbread. It’s also a lot healthier than standard cornbread. 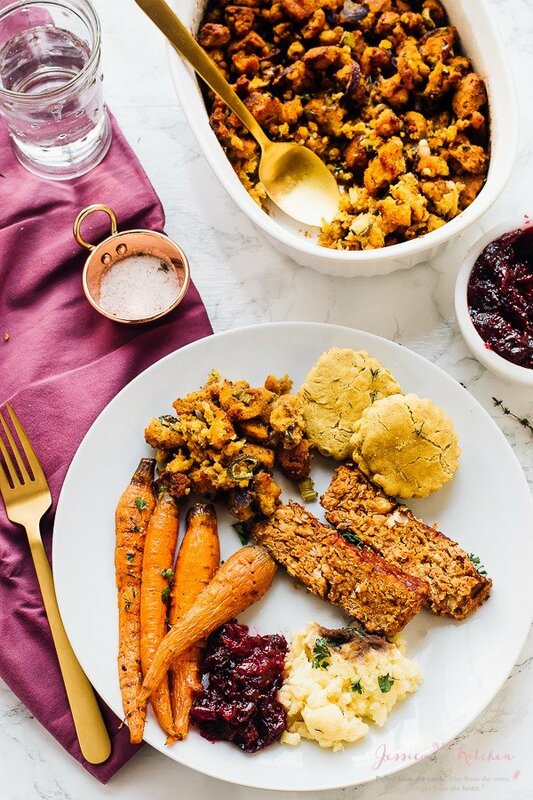 If you try this Gluten Free Cornbread Stuffing please let me know in the comment section below, or tag me on instagram with the hashtag #jessicainthekitchen! For more exclusive recipes follow me on Instagram AND on Snapchat: jessinkitchen. Ensure your cornbread is dried out. If it's still a bit moist, stick it in the oven on a baking sheet while the oven is preheating for about 15 minutes or so until dried out. It should feel like just gone stale bread. In a pan over medium heat, melt the coconut oil and add the onion, garlic, celery. Add the thyme, sage, salt and pepper, stir together, and look cook until onions are tender and garlic is fragrant, about 5 to 8 minutes. Remove from heat. In a casserole dish, add the cornbread pieces. Add the cooked down veggies. Add the flax egg and combine everything. Add the vegetable broth and stir everything together once more to incorporate. If you want more liquid, just add some more vegetable broth by the ¼ cup until it's moist enough for you. Alternatively, if you prefer drier cornbread, add a cup at a time until your preferred moist level. Bake for 25 minutes until cornbread is set and top becomes golden brown and slightly crusty.. Remove, cool slightly and serve. Enjoy! Store this cornbread in an airtight tupperware container or it’s original container with a top in your fridge for up to a week. This cornbread can also be frozen for up to a month and thawed in the fridge overnight. Reheat in the oven at 350 degrees until heated through, about 15 minutes. You may need to add a little bit of vegetable broth over the top before baking after thawing since your cornbread may be a little dry now. I’ve actually never made my own stuffing (GASP)! Your version looks incredible! Love that it uses your flavorful cornbread muffins in place of bread! So much flavor! Beautiful presentation! And it’s gluten free?! Perfect! Pinned! I only started making stuffing about two years ago. Now it’s my family’s favorite dish! 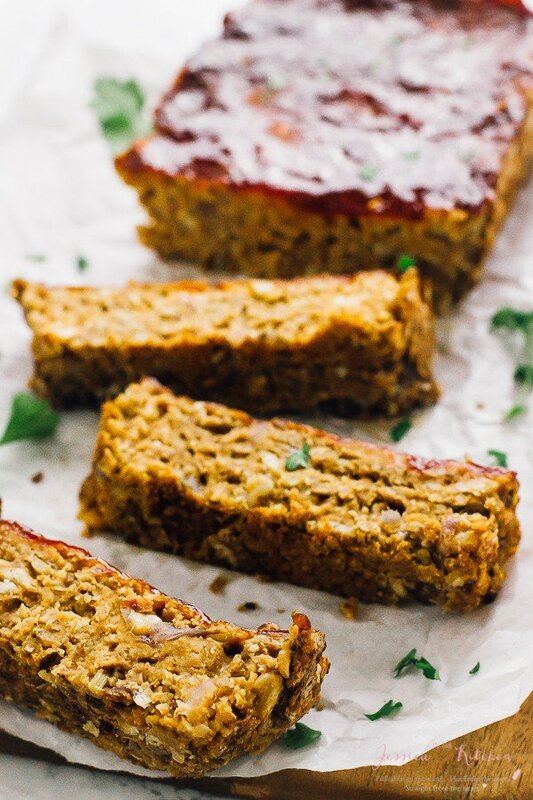 Next I have to try a cornbread version – this looks great! Thanks so much Megan!! So awesome re the stuffing too! I’m obsessed with your recipes !! The best. Aw thanks so much Alexandra!! This looks so delicious! I’m adding this to my Thanksgiving menu. I don’t heat my flax though, what would you recommend instead of the flax egg? Thank you! You could just use a different egg replacer like the one by Bob’s Red Mill!! I hope you enjoy so much! !